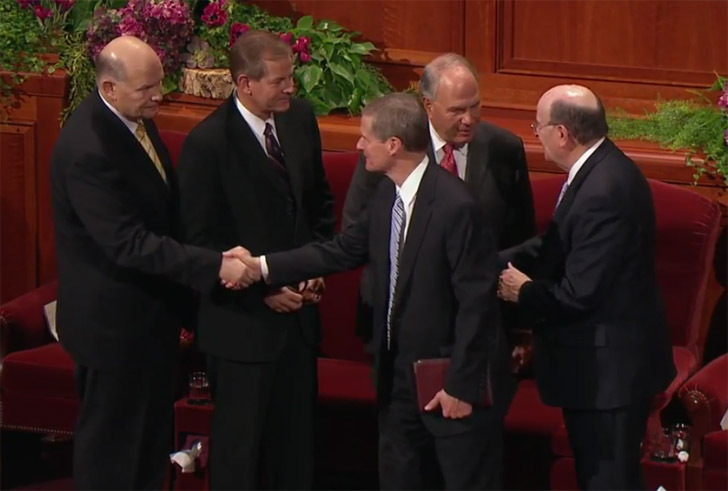 The three new apostles were asked to bear their testimonies in the Sunday morning session of General Conference. They spoke of how they were called, their sense of inadequacy and their witness of the Savior. Share the accompanying memes on your Facebook and other social media pages. If I could leave one small message with you today it would be this; The Lord has said, “Love one another; as I have loved you.” I’m confident that there is no choice, sin, or mistake that you or anyone else can make that will change His love for you or for them. That does not mean He excuses or condones sinful conduct; l’m sure He does not; but, it does mean we are to reach out to our fellowman in love to invite, persuade, serve, and to rescue. Jesus Christ looked past people’s ethnicity, rank, and circumstances in order to teach them this profound truth. I have been asked many times when did I receive my testimony. I can’t remember not believing in Heavenly Father and Jesus Christ. I have loved them since I learned of them at the knees of my angel mother reading scripture and gospel stories. That early belief has now grown into a knowledge and witness of a Loving Heavenly Father who hears and answers our prayers. My testimony of Jesus Christ has been built from many special experiences where I have come to know His great love for each one of us. I’m grateful for our Savior’s Atonement and wish like Alma to shout it with the trump of an Angel. And so it was on Tuesday morning of this week, just after 9:00 am as the Bishopric was beginning a meeting with the Asia Area Presidency, who are here for conference, that I was called to meet with President Monson, along with his counselors. Moments later, as I walked into the board room, adjacent to his office, I must have looked nervous sitting across the table, as he kindly spoke to calm my nerves. He commented, noting my age, that I seemed quite young, and even looked younger than my age. Then, within a few moments, President Monson described that acting on the will of The Lord, a call to the Quorum of the Twelve was being extended to me. He asked me if I would accept this call, to which, following what I am sure was a very undignified audible gasp, in complete shock, I responded affirmatively. And then, before I could even verbalize a tsunami of indescribable emotion, most of which were feelings of inadequacy. Our loving Heavenly Father and His Son Jehovah, with a knowledge of the end from the beginning, opened the heavens and a new dispensation to offset the calamities that They knew would come. The Apostle Paul described the forthcoming calamities as “perilous times.” For me this suggests that Heavenly Father’s generous compensation for living in perilous times is that we also live in the fullness of times. As I agonized over my inadequacies this wee, I received a distinct impression which both chastened and comforted me: to focus not on what I can’t do, but rather on what I can do. I can testify of the plain and precious truths of the gospel. My call gives ample evidence to the truthfulness of the Lord’s statement early in this dispensation, “that the fulness of my gospel might be proclaimed by the weak and the simple unto the ends of the world…” I am one of those weak and simple. When I was called to be the bishop of a ward in the eastern United States, my brother, slightly older and much wiser than I, called me on the phone. He said, “You need to know that the Lord hasn’t called you because of anything you have done. In your case, it is probably in spite what you have done. The Lord has called you for what He needs to do through you and that will only happen if you do it His way.” I recognize that this wisdom from an older brother applies even more today. In my past profession, I was a cardiologist specializing in heart failure and transplantation. Since many patients were critically ill, I saw many people die. My wife jokingly says that it was a bad prognostic sign to become one of my patients. Because of my experience with this patient population, I developed a kind of emotional distance when things went poorly. That way, feelings of sadness and disappointment were tempered. In 1986, a young man named Chad developed heart failure and needed a heart transplant. He did very well for a decade and a half. Chad did all he could to stay healthy and live as normal a life as possible. He served a mission, worked, and was a devoted son to his parents. The last few years of his life, though, were challenging and he was in and out of the hospital frequently. One evening, he was brought to the hospital’s emergency room in full cardiac arrest. My associates and I worked for a long time to restore his circulation. Finally, it became clear that Chad could not be revived. We stopped our futile efforts and I declared him dead. Although sad and disappointed, I thought to myself, “Chad has had good care. He has had many more years of life than he otherwise would have had.” That emotional distance was shattered, though, as his parents came into the emergency room bay and saw their deceased son lying on a stretcher. For the first time, I saw Chad through his mother’s and father’s eyes. I saw the great hopes and expectations they had had for him, the desire they had that he would live just a little bit longer and a little bit better. With this realization, I began to weep. In an ironic reversal of roles and in an act of kindness I will never forget, Chad’s parents comforted me. I now realize that to effectively serve others, we must see them through a parent’s eyes, through Heavenly Father’s eyes. Only then can we begin to comprehend the true worth of a soul. Only then can we sense the love that Heavenly Father has for all of His children. Only then can we sense the Savior’s caring concern for them. We cannot completely fulfill our covenant obligation to mourn with those that mourn and comfort those who stand in need of comfort unless we see them through God’s eyes. This expanded perspective will open our hearts to others’ disappointments, fears, and heartaches. But, Heavenly Father will aid and comfort us, just as Chad’s parents comforted me in the emergency room years ago. We need to have eyes that see, ears that hear, and hearts that know and feel if we are to accomplish the rescue so frequently encouraged by President Thomas S. Monson. With all my heart I want to be a true follower of Jesus Christ. I love Him. I adore Him. I witness of His living reality. I witness that He is the “Anointed One,” the Messiah. I am a witness of His incomparable mercy, compassion, and love.